This forum. 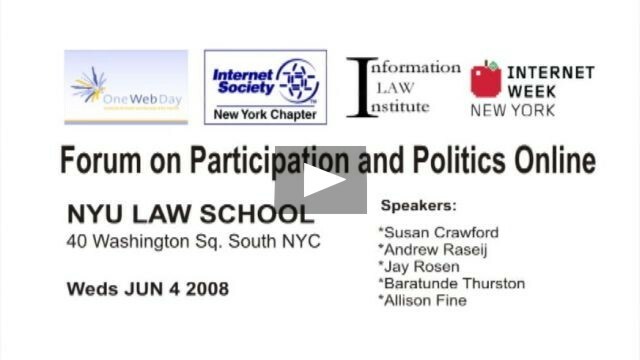 presented by OneWebDay, ISOC-NY, and the Information Law Institute @ NYU during Internet Week NY, is part of the build up to a politically-minded OneWebDay on September 22, 2008. It brought together a variety of renowned scholars, thinkers, and activists to provide their perspectives on political engagement on the Net. The forum happened to occur on the day after Barack Obama clinched the presidential nomination.